Acute renal failure (ARF) secondary to ischemic or nephrotoxic injury remains a common and potentially devastating problem in clinical nephrology, with a persistently high rate of mortality despite significant advances in supportive care (1–4⇓⇓⇓). Pioneering studies over several decades have illuminated the roles of persistent vasoconstriction, tubular obstruction, cellular structural and metabolic alterations, and the inflammatory response in the pathogenesis of ARF (4–7⇓⇓⇓). Although these studies have paved the way for successful therapeutic approaches in animal models, translational research efforts in humans have yielded disappointing results (2–4⇓⇓). The reasons for this may include the multifaceted response of the kidney to ischemia and nephrotoxins and a paucity of early markers for ARF with a resultant delay in initiating therapy (4–8⇓⇓⇓⇓). Attempts to unravel the molecular basis of these myriad early renal responses have been facilitated by recent advances in functional genomics that have yielded new tools for genome-wide analysis of complex biologic processes such as ischemic ARF (8–11⇓⇓⇓). The cDNA microarray methods provide parallel and quantitative expression profiles of thousands of genes, which when combined with bioinformatic tools can identify genes in a biologic pathway, characterize the function of novel genes, and detect disease subclasses (9). Using this screening technique, we have identified a subset of seven genes whose expression is upregulated >10-fold within the first few hours after ischemic renal injury in a mouse model. One of these transcripts, cysteine-rich protein 61 (Cyr61), has very recently been confirmed to be induced by renal ischemia (8), but the behavior of the other six differentially expressed genes is novel to the ARF literature. In this study, we chose to characterize further one of these previously unrecognized genes, namely neutrophil gelatinase-associated lipocalin (NGAL), because it is a small secreted polypeptide that may be detectable in the urine, in particular because it is protease resistant. Our results indicate that NGAL may represent a novel early urinary biomarker for ischemic and nephrotoxic renal injury. We used well-established murine models in which the structural and functional consequences of brief periods of renal ischemia have been previously documented (11–15⇓⇓⇓⇓). Briefly, male Swiss-Webster mice (Taconic Farms, Germantown, NY) weighing 25 to 35 g were housed with 12:12-h light:dark cycle and were allowed free access to food and water. The animals were anesthetized with sodium pentobarbital (50 mg/kg intraperitoneally) and placed on a warming table to maintain a rectal temperature of 37°C. Three separate protocols were used: (1) unilateral ischemia without ARF, (2) bilateral ischemia with ARF, and (3) bilateral mild subclinical ischemia. For the unilateral ischemia experiments, the left renal pedicle was occluded with a nontraumatic vascular clamp for 45 min, during which time the kidney was kept warm and moist. The clamp was then removed, the kidney was observed for return of blood flow, and the incision was sutured. The mice were allowed to recover in a warmed cage, and timed urine collections were obtained. After 0, 3, 12, or 24 h of reperfusion, the animals were re-anesthetized, the abdominal cavity was opened, and blood was obtained via puncture of the inferior vena cava for measurement of serum creatinine by quantitative colorimetric assay kit (Sigma, St. Louis, MO). The mice were killed, the kidneys were perfusion fixed in situ with 4% paraformaldehyde in PBS, and both kidneys were harvested (the right kidney served as a control for each animal). At least three separate animals were examined at each of the reflow periods. One half of each kidney was snap frozen in liquid nitrogen and stored at −70°C until further processing; a sample was fixed in formalin, paraffin-embedded, and sectioned (4 μm). Paraffin sections were stained with hematoxylin-eosin and examined histologically. The clamped kidneys displayed the characteristic morphologic changes resulting from ischemia-reperfusion injury, as previously published by others (12–14⇓⇓) and us (11). The other half of each kidney was embedded in OCT compound (Tissue-Tek), and frozen sections (4 μm) were obtained for immunohistochemistry. For the bilateral ischemia with ARF experiments, both kidneys were clamped for 30 min and examined at various reflow periods as detailed above. This group of eight animals was designed to represent clinical ARF and displayed a significant elevation in serum creatinine at 24 h after the injury. For the bilateral mild subclinical ischemia experiments, both kidneys were clamped for 5, 10, or 20 min only and examined at various reperfusion periods as above. This mild degree of injury was designed to simulate subclinical renal ischemia, and mice in this group did not display any elevations in serum creatinine measured at 24 h after the injury. 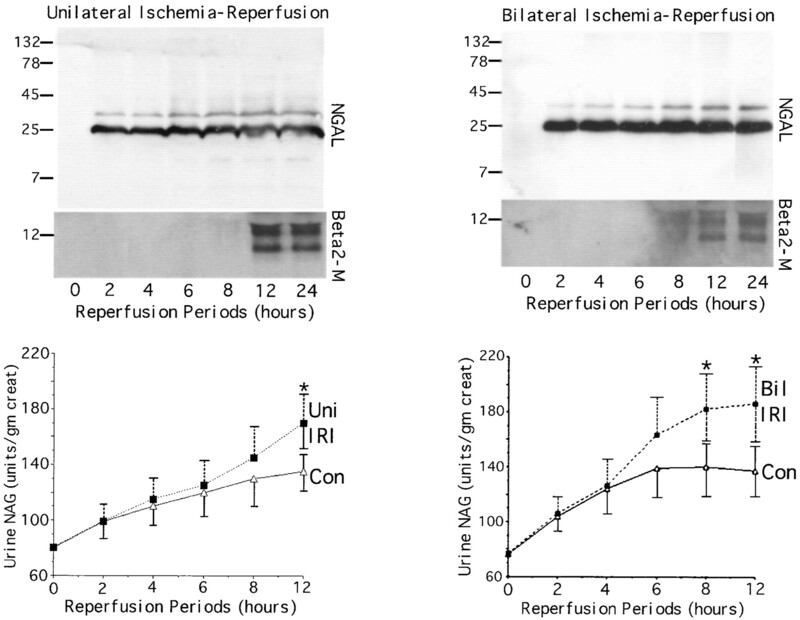 We used well-established rodent models of renal ischemia-reperfusion injury (10). Briefly, male Sprague-Dawley rats weighing 200 to 250 g (Taconic Farms) were anesthetized with ketamine (150 μg/g) and xylazine (3 μg/g) and subjected to bilateral renal artery occlusion with microvascular clamps for 30 min as detailed in the mouse protocol. Timed urine collections were obtained at 3, 6, 9, 12, and 24 h of reperfusion, and blood was collected for creatinine measurement at the time of killing (24 h). We used well-established murine models in which the structural and functional consequences of cisplatin administration have been previously documented (16–18⇓⇓). Briefly, mice were given a single intraperitoneal injection of cisplatin (20 mg/kg body wt). This results in tubule cell necrosis and apoptosis and elevated blood urea nitrogen within 3 d after the cisplatin injection (16–18⇓⇓). Animals were housed in metabolic cages, and urine collections were obtained daily. Mouse whole kidney tissues (or cultured human proximal tubule cells; see below) were disrupted with a Tissue Tearor (Biospec Products, Racine, WI). Total RNA from control and ischemic kidneys was isolated using the RNeasy Mini Kit (Qiagen, Valencia, CA) and quantified by spectrophotometry. Detailed descriptions of microarray hardware and procedures have been published previously (11). Briefly, for each experiment, 100 μg of purified total mouse kidney RNA was reverse transcribed with Superscript II reverse transcriptase (Life Technologies, Rockville, MD) in the presence of Cy3-dUTP (Amersham, Piscataway, NJ) for controls and Cy5-dUTP for ischemic samples. The cDNA samples were purified using a Microcon YM-50 filter (Millipore, Madison, WI) and hybridized to microarray slides containing 8979 unique sequence-verified mouse probes (11). Three separate animals were examined for each of the reflow periods, and at least two independent microarray experiments were performed for each of the animals. The array slides were scanned using a microarray scanner (GenePix 4000B; Axon Instruments, Foster City, CA) to obtain separate TIFF images for Cy3 and Cy5 fluorescence. The signal intensities for Cy3 and Cy5 were determined for individual genes using the GenePix Pro 3.0 data extraction software (Axon Instruments). Quality control and data analysis was completed as described previously (11). An equal amount (1 μg) of total RNA from control and experimental mouse kidneys was reverse transcribed with Superscript II reverse transcriptase (Life Technologies) in the presence of random hexamers according to the manufacturer’s instructions. PCR was accomplished using a kit (Roche, Indianapolis, IN) and the following primers: mouse NGAL sense 5′-CACCACGGACTACAACCAGTTCGC-3′, mouse NGAL antisense 5′-TCAGTTGTCAATGCATTGGTCGGTG-3′, human NGAL sense 5′-TCAGCCGTCGATACACTGGTC-3′, and Human NGAL antisense 5′-CCTCGTCCGAGTGG-TGAGCAC-3′. Primer pairs for mouse and human β-actin and glyceraldehyde-3-phosphate dehydrogenase (GAPDH) were obtained from Clontech (La Jolla, CA). Mock reactions devoid of cDNA served as negative controls. PCR products were analyzed by agarose gel electrophoresis followed by staining with ethidium bromide and were quantified by densitometry. Fold changes in NGAL mRNA expression in ischemic versus control kidneys were expressed after normalization for β-actin or GAPDH amplification. For NGAL detection, frozen sections were permeabilized with 0.2% Triton X-100 in PBS for 10 min, blocked with goat serum for 1 h, and incubated with primary antibody to NGAL (1:500 dilution) for 1 h. Slides were then exposed for 30 min in the dark to secondary antibodies conjugated with Cy5 (Amersham, Arlington Heights, IL) and visualized with a fluorescence microscope (Zeiss Axiophot) equipped with rhodamine filters. For co-localization of NGAL with Rab11, serial sections were first incubated with NGAL antibody or a monoclonal antibody to Rab11 (1:500 dilution; Transduction Laboratories), then with secondary antibodies conjugated with either Cy5 (for NGAL) or Cy3 (for Rab11) and visualized with rhodamine or fluorescein filters, respectively. For co-localization of NGAL with proliferating cell nuclear antigen (PCNA), sections were co-incubated with NGAL antibody and a monoclonal antibody to PCNA (1:500 dilution; Upstate), and was detection accomplished by immunoperoxidase staining (ImmunoCruz Staining System, Santa Cruz Biotechnology). For the TUNEL assay, we used the ApoAlert DNA Fragmentation Assay Kit (Clontech). Paraffin sections were deparaffinized through xylene and descending grades of ethanol, fixed with 4% formaldehyde/PBS for 30 min at 4°C, permeabilized with proteinase K at room temperature for 15 min and 0.2% triton X-100/PBS for 15 min at 4°C, and incubated with a mixture of nucleotides and TdT enzyme for 60 min at 37°C. The reaction was terminated with 2× SSC, and the sections washed with PBS and mounted with Crystal/mount (Biomeda, Foster City, CA). TUNEL-positive apoptotic nuclei were detected by visualization with a fluorescence microscope. Mice or rats were placed in metabolic cages (Nalgene, Rochester, NY), and urine was collected before and every hour after bilateral renal artery occlusion. Urine samples were centrifuged at 5000 × g to remove debris, and the supernatant was analyzed by Western blotting. Urinary creatinine was measured by quantitative colorimetric assay kit (Sigma) to normalize samples for urinary NGAL determination. A colorimetric assay kit for the determination of N-acetyl-β-d-glucosaminidase (NAG) in the urine was obtained from Roche. Human renal proximal tubular epithelial cells (RPTEC) were obtained from Clonetics (San Diego, CA). Cells were grown in renal epithelial cell basal medium supplemented with Renal Epithelial Cell Growth Medium (REGM) complex (0.5 μl/ml hydrocortisone, 10 pg/ml hEGF, 0.5 μg/ml epinephrine, 6.5 pg/ml triiodothyronine, 10 μg/ml transferrin, 5 μg/ml insulin, 1 μg/ml gentamicin sulfate, and 2% FBS), as recommended by the manufacturer. We modified previously described protocols of in vitro ischemia by ATP depletion with inhibitors of oxidative phosphorylation (19,20⇓). On the second day postconfluence, RPTEC cells were incubated with 1 μm of antimycin A (Sigma) for varying periods of time up to 6 h. We have previously shown that this results in mild partial reversible ATP depletion and no loss of cell viability in other types of cultured renal epithelial cells such as MDCK (19) and 786-O (20) cells. ATP levels were monitored using a luciferase-based assay kit (Sigma) and expressed as a percentage of control values. Cells were harvested at various time points of ATP depletion and analyzed for NGAL mRNA expression by reverse transcription-PCR (RT-PCR) and NGAL protein expression by Western analysis. The secretion of NGAL into the culture medium was also monitored. All chemicals were purchased from Sigma unless otherwise specified. For Western blotting, protein concentrations were determined by the Bradford assay (Bio-Rad, Hercules, CA), and equal amounts of total protein were loaded in each lane. Monoclonal antibody to α-tubulin (Sigma) was used at 1:10,000 dilution for confirmation of equal protein loading, and polyclonal antibody to NGAL was used at 1:500 (21). Monoclonal antibody to β2-microglobulin was used at 1:500 (Sigma). Immunodetection of transferred proteins was achieved using enhanced chemiluminescence (Amersham). We used murine models in which the structural and functional consequences of brief periods of renal ischemia have been documented (11–15⇓⇓⇓⇓). The characteristic histopathologic features of ischemic injury were readily evident in the 24-h reperfusion samples after both unilateral (45 min) and bilateral (30 min) ischemia. These included a loss of brush border membranes, tubular dilation, flattened tubular epithelium, luminal debris, and an interstitial infiltrate (Figure 1). We documented the presence of apoptotic cells using the TUNEL assay. Apoptosis was predominantly localized to distal tubular cells and ascending limb of Henle’s loop, both in detached cells within the lumen as well as attached cells. Occasional proximal tubular cells were also apoptotic, but the glomeruli were essentially devoid of apoptosis. No TUNEL-positive cells were detected in the control kidneys or in the ischemic samples where TdT was omitted (not shown). The above histologic and apoptotic changes were absent from kidneys subjected to milder degrees of ischemia (5, 10, or 20 min of bilateral ischemia; not shown). The serum creatinine levels were reflective of the histopathologic changes observed. Thus, mice with unilateral renal ischemia or mild degrees of subclinical bilateral ischemia displayed serum creatinine levels that were indistinguishable from control animals, whereas mice with bilateral ischemia for 30 min showed a significant elevation of serum creatinine (Figure 1). Figure 1. Characterization of the mouse model of ischemic renal injury. Left panels show the results of hematoxylin and eosin staining (top) and TUNEL staining (bottom) of kidney sections from control mice or after 24 h of ischemia-reperfusion (IRI). (Right) Results of serum creatinine determinations in control mice (Con), after unilateral ischemia for 45 min (U45), or after bilateral ischemia for various periods as shown. *P < 0.05 versus control. Numbers within bars indicate number of animals. By microarray analysis of mice with unilateral renal ischemia, NGAL was found to be consistently induced (3.2 ± 0.5-fold, 11.1 ± 1.2-fold, and 4.3 ± 0.6-fold at 3, 12, and 24 h of reperfusion) in the ischemic mouse kidney when compared with the control kidneys from the same animal (mean ± SD from three animals at each time point). This finding was confirmed by semiquantitative RT-PCR, using a normalization protocol with both β-actin and GAPDH. No significant changes in mRNA expression of either β-actin or GAPDH were noted at any of the reperfusion periods examined, as described previously (11). However, using mouse-specific primers, we detected a significant upregulation of NGAL mRNA expression (4.1 ± 0.5-fold, 9 ± 0.6-fold, and 4.2 ± 0.4-fold at 3, 12, and 24 h of reperfusion, respectively, where values represent mean ± SD from three separate animals). These results are illustrated in Figure 2 and are in overall agreement with the changes detected by transcriptome analysis. Figure 2. Induction of mouse kidney neutrophil gelatinase-associated lipocalin (NGAL) mRNA after ischemia. (Top) Representative reverse transcription-PCR (RT-PCR) with primers for mouse actin and NGAL, using RNA extracted from kidneys of control (C) mice or after various reperfusion periods as shown (hours). Lane M contains a 100-bp DNA ladder. (Bottom) Fold increase in NGAL mRNA expression at various time points from control (CON). Values obtained by microarray (solid line) versus RT-PCR (dotted line) are means ± SD from three experiments at each time point. It was next of interest to determine whether the postischemic expression of NGAL protein in the kidney parallels that of the mRNA. By Western analysis, NGAL was just detectable as a 25-kD immunoreactive peptide in control mouse kidneys. The identity of this band as NGAL was established in a separate set of experiments, where preincubation of the primary antibody with recombinant mouse lipocalin completely blocked this immunoreactivity (not shown). In the unilateral ischemia experiments, NGAL expression was induced three- to fourfold by densitometry in the ischemic kidney from five separate animals within 3 h of injury, as shown in Figure 3. This response was dramatically enhanced in the bilateral ischemia experiments from eight separate animals. NGAL in these mice was induced threefold after 3 h of reperfusion, peaked at >12-fold in the 24-h samples, and declined to normal levels by the 72-h recovery period (Figure 3). Figure 3. Induction of mouse kidney NGAL protein after unilateral or bilateral ischemia. 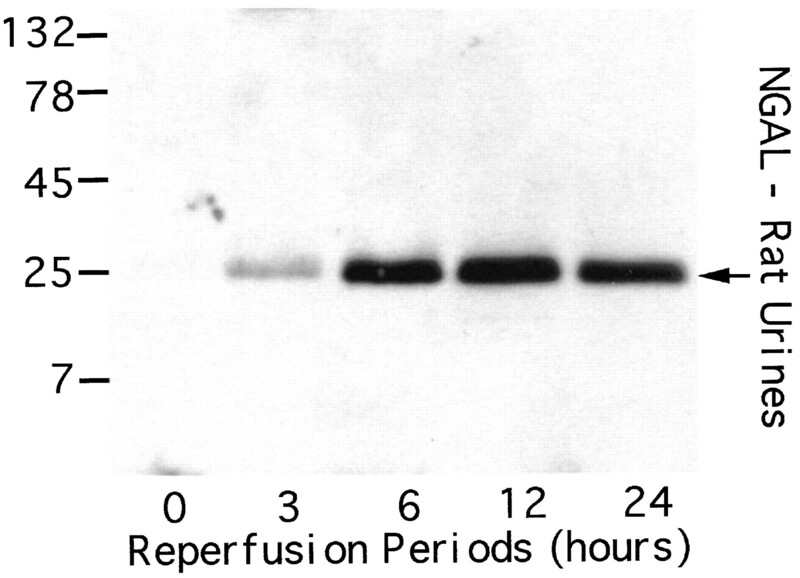 (Top) Representative Western blots with whole kidney samples obtained from control (Con) mice or after reperfusion periods as shown (hours), probed with a polyclonal antibody to NGAL or a monoclonal antibody to tubulin (to demonstrate equal protein loading). Molecular weight markers are to the left. (Bottom) Fold increase in NGAL protein expression at various time points from control (CON). Values obtained by densitometry are means ± SD from five animals for unilateral ischemia and eight animals for bilateral ischemia. Using immunohistochemical techniques, we next demonstrated that NGAL protein was barely detectable in control mouse kidneys but is upregulated predominantly in proximal tubules within 3 h of ischemia as illustrated in Figure 4. Identification of proximal tubules in these sections was based on the presence of a brush border membrane, ratio of nuclear to cell size, and cellular morphology. The induced NGAL appeared in a punctate cytoplasmic distribution within proximal tubule cells, reminiscent of a secreted protein. This pattern of expression was identical in both unilateral and bilateral models of ischemia-reperfusion injury and was consistently evident in every animal studied. The glomeruli were devoid of NGAL expression, and no NGAL-expressing neutrophils were evident. Because NGAL has been shown in cultured Wilms tumor kidney cells to co-localize at least in part with endosomes (21), we examined in serial sections the distribution of NGAL and Rab11 (a marker of late recycling endosomes). Merged images showed a significant co-localization of NGAL with Rab11 (Figure 4). To explore the functional significance of enhanced NGAL expression after ischemia, we examined serial kidney sections for NGAL expression, TUNEL-positive nuclei, or PCNA-positive nuclei. Whereas tubule cells overexpressing NGAL were not TUNEL-positive (not shown), a significant co-localization of NGAL and PCNA was evident in the proliferating and regenerating cells at the 48-h reflow period (Figure 4). Figure 4. Induction of mouse kidney NGAL protein after ischemia. (Top) Representative immunohistochemistry results on frozen sections of mouse kidneys obtained from control mice or after varying periods of reflow as shown (hours), probed with a polyclonal antibody to NGAL. G, glomerulus. The panel labeled HP is a high power 100× magnification, and the other panels are at 20×. (Bottom) The left two panels show a tubule after 3 h of reperfusion, expressing NGAL (red) or Rab11 (green). The third panel shows a merged image, indicating co-localization in yellow. The panel on the extreme right shows co-localization of NGAL with proliferating cell nuclear antigen in tubules after 48 h of reflow. It was next of considerable interest to determine whether the postischemic expression of NGAL protein could be detected in the urine, thereby suggesting its utility as an early noninvasive biomarker of ischemic renal injury. With the use of urinary creatinine concentrations to equalize for sample loading, NGAL was absent from the urine before ischemia. In striking contrast, NGAL was manifest as a 25-kD band within 2 h of the injury (in the very first urine output after ischemia) in all animals examined (five with unilateral and eight with bilateral ischemia), as shown in Figure 5. The identity of this band as NGAL was established in a separate set of experiments, in which preincubation of the primary antibody with recombinant mouse lipocalin completely blocked this immunoreactivity (not shown). Remarkably, NGAL was easily detectable in as little as 1 μl of unprocessed urine by Western analysis and persisted for the entire duration examined (24 h of reperfusion). We then compared urinary NGAL excretion with that of previously established markers of injury, such as β2-microglobulin and NAG. Whereas urinary NGAL was evident within 2 h of ischemia, β2-microglobulin was detectable in the same urinary samples only after 12 h of unilateral and 8 h of bilateral ischemia (Figure 5). Similarly, urinary NAG excretion was significantly increased only after 12 h of unilateral and 8 h of bilateral ischemia when compared with nonischemic control animals (Figure 5). Figure 5. Early detection of NGAL protein in the urine in mice with ischemic acute renal failure (ARF). (Top) Representative Western blots of unprocessed urine samples (1 to 2 μl per lane, normalized for creatinine content) obtained at reperfusion periods as shown (hours), after unilateral or bilateral renal artery clamping. Molecular weight markers are shown on the left. Blots were probed with NGAL (top) or β2-microglobulin (Beta2-M; middle). (Bottom) Urinary N-acetyl-β-d-glucosaminidase (NAG) determinations at various reperfusion periods as indicated, from five animals for unilateral ischemia and eight animals for bilateral ischemia. Values are means ± SD. *P < 0.05 versus control at each time point, ANOVA. To determine the sensitivity of urinary NGAL detection in the absence of overt ARF, we used protocols whereby separate sets of mice were subjected to only 5, 10, or 20 min of bilateral renal artery occlusion. These studies were designed to assess urinary NGAL excretion after mild subclinical renal ischemia. Serum creatinine measured after 24 h of reflow was within normal limits in all of these mice (Figure 1). Striking, NGAL was easily detected in as little as 1 μl of unprocessed urine in these animals (Figure 6), although its appearance was somewhat delayed compared with animals with overt ARF. Thus, whereas 30 min of bilateral ischemia resulted in urinary NGAL excretion within 2 h (Figure 5), mice with 20 or 10 min of bilateral ischemia manifested urinary NGAL after 4 h and those with 5 min of ischemia excreted NGAL only after 6 h (Figure 6). Thus, the appearance NGAL in the urine correlates with the dose and duration of renal ischemia. Figure 6. Detection of NGAL protein in the urine in mice with subclinical renal ischemia. Representative Western blot of unprocessed urine samples (1 to 2 μl per lane, normalized for creatinine content) obtained at reperfusion periods as shown (hours), after 5, 10, or 20 min of bilateral renal artery clamping. Molecular weight markers are shown on the left. These animals displayed normal serum creatinines at 24 h of reflow. Because a debate exists regarding species differences in the responses to renal artery occlusion (22), we next examined the behavior of NGAL in a different animal model, namely a well-established rat model of renal ischemia-reperfusion injury. With the use of urinary creatinine concentrations to equalize for sample loading, NGAL was absent from the urine before ischemia. In marked contrast, NGAL was manifest as a 25-kD immunoreactive peptide within 3 h of the injury (in the very first urine output after ischemia), as shown in Figure 7. In comparison, the serum creatinine in this model of ischemic injury was elevated only after 24 h of reperfusion (not shown). Once again, NGAL was detectable in 1 μl of unprocessed urine and persisted for the entire duration examined (24 h of reperfusion). Figure 7. Early detection of NGAL protein in the urine in rats with ischemic ARF. Representative Western blot of unprocessed urine samples (1 to 2 μl per lane, normalized for creatinine content) obtained at reperfusion periods as shown (hours), after 30 min of bilateral renal artery clamping in rats. Molecular weight markers are shown on the left. These animals displayed a significant increase in serum creatinine at 24 h of reflow. To confirm the origin of NGAL from ischemic proximal tubule cells, we modified previously described protocols of in vitro ischemia by ATP depletion in cultured human proximal tubule cells (RPTEC). Incubation in 1 μm of antimycin resulted in a mild partial ATP depletion to approximately 83 ± 3% of control within 1 h, with a more gradual decrease to approximately 75 ± 3% of control by 6 h (mean ± SD from four experiments). No morphologic consequences of this mild ATP depletion were discernible. NGAL mRNA was just detectable in resting cells. However, after partial ATP depletion, a rapid and duration-dependent induction of NGAL mRNA was evident by RT-PCR, as shown in Figure 8. Figure 8. Induction of NGAL mRNA after ischemia in vitro. (Top) Representative RT-PCR with primers for human NGAL, using RNA extracted from renal proximal tubular epithelial cells (RPTEC) cells after various periods of partial ATP depletion as shown (hours). Lane M contains a 100-bp DNA ladder. 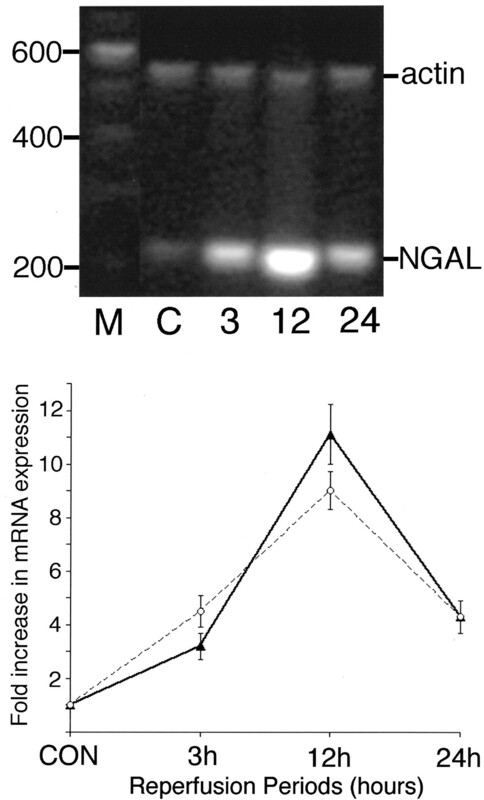 (Middle) Fold increase in NGAL mRNA expression at various time points from control (0), normalized for glyceraldehyde-3-phosphate dehydrogenase expression. Values shown are means ± SD from three experiments at each time point. (Bottom) Representative Western blot with RPTEC samples after various periods of partial ATP depletion as shown (hours), obtained from equal amounts of cell pellets (Pel) or the culture medium (Sup), probed with a polyclonal antibody to NGAL. Molecular weight markers are to the left. Figure is representative of three separate experiments. We next examined NGAL protein expression in RPTEC cells and the culture medium after mild ATP depletion. NGAL protein was detectable in control RPTEC cells, and its expression increased after ATP depletion in a duration-dependent manner, as shown in Figure 8. No NGAL immunoreactive protein was found in the culture medium from control cells, but NGAL was easily detectable within 1 h of mild ATP depletion (Figure 8). Further increases in NGAL protein abundance were noted related to the duration of ATP depletion. These results suggest that the induced NGAL protein is rapidly secreted into the medium, analogous to the swift appearance of NGAL in the urine after renal ischemia in vivo. We next wished to determine whether NGAL may be detected in the urine after other forms of tubule cell injury. In an established mouse model of cisplatin nephrotoxicity, NGAL was easily detected in the urine within 1 d of cisplatin administration (Figure 9). In contrast, urinary β2-microglobulin was barely detectable after 2 d and could not be reliably detected until day 4 to 5 after cisplatin. Similarly, increased urinary NAG excretion was not evident until days 4 and 5 after cisplatin administration (Figure 9). Figure 9. Early detection of NGAL protein in the urine in mice with cisplatin-induced injury. (A) Representative Western blots on unprocessed urine samples (1 to 2 μl per lane, normalized for creatinine content) obtained at days as shown after cisplatin administration, probed with antibody to β2-microglobulin or NGAL. Molecular weight markers are shown on the left. (B) Urinary NAG determinations at various days after cisplatin administration (n = 4). Values are means ± SD. *P < 0.05 versus day 0. We used a transcriptome-wide interrogation strategy to identify renal genes that are induced early after renal ischemia, whose protein products might serve as novel biomarkers for ARF. We identified seven genes that are upregulated >10-fold, one of which (Cyr61) has recently been reported to be induced after renal ischemia (8). Unexpected, the induction of the other six transcripts was novel to the ARF field. In this study, we chose to characterize further one of these previously unrecognized genes, namely NGAL. NGAL belongs to the lipocalin superfamily of >20 structurally related secreted proteins that are thought to transport a variety of ligands within a β-barreled calyx (23). Human NGAL was originally identified as a 25-kD protein covalently bound to gelatinase from human neutrophils, where it represents one of the neutrophil secondary granule proteins (24,25⇓). Molecular cloning studies have revealed human NGAL to be similar to the mouse 24p3 gene first identified in primary cultures of mouse kidneys that were induced to proliferate (26). NGAL is expressed at very low levels in other human tissues, including kidney, trachea, lungs, stomach, and colon (27). NGAL expression is markedly induced in stimulated epithelia. For example, it is upregulated in colonic epithelial cells in areas of inflammation or neoplasia but is absent from intervening uninvolved areas or within metastatic lesions (28). NGAL concentrations are elevated in the serum of patients with acute bacterial infections (29), the sputum of subjects with asthma or chronic obstructive pulmonary disease (30), and the bronchial fluid from the emphysematous lung (31). In all of these cases, NGAL induction is postulated to be the result of interactions between inflammatory cells and the epithelial lining, with upregulation of NGAL expression being evident in both neutrophils and the epithelium (28–32⇓⇓⇓⇓). Upregulation of NGAL in the mature kidney has hitherto not been described. Several lines of evidence gleaned from our study suggest that the detected NGAL induction represents a novel intrinsic response of the kidney proximal tubule cells to ischemic injury and is not derived merely from activated neutrophils. First, the response is extremely rapid, with NGAL appearing in the urine within 2 h of the injury (in the very first urine output after renal artery occlusion), and renal neutrophil accumulation in this model of ischemic ARF is usually first noted at 4 h after injury (33–35⇓⇓). Second, the temporal patterns of NGAL induction and neutrophil accumulation are divergent. NGAL mRNA and protein expression was maximally noted at 12 h of reflow, whereas neutrophil accumulation peaks at 24 h (33–35⇓⇓), by which time NGAL expression has significantly declined. Third, no NGAL-expressing neutrophils were detectable by immunofluorescence in the kidney samples examined (Figure 4). Fourth and most persuasive, NGAL mRNA and protein induction was documented to occur in cultured human proximal tubule cells after in vitro ischemia, with NGAL secreted into the culture medium within 1 h of ATP depletion, in a system in which neutrophils are absolutely absent. However, our in vivo studies do not allow us to exclude completely some contribution from infiltrating activated neutrophils to the observed NGAL upregulation. Indeed, it is possible that upregulation of NGAL in renal tubule cells may be induced by local release of cytokines from neutrophils trapped in the microcirculation early after ischemic injury. An adequate explanation for the induction of NGAL by stimulated epithelia has been lacking, and whether NGAL is protective or proximate to injury or even an innocent bystander remains unclear. Recent evidence suggests that, at least in a subset of cell types, NGAL may represent a proapoptotic molecule (36–38⇓⇓). In the mouse pro-B lymphocytic cell line, cytokine withdrawal resulted in a marked induction of NGAL as well as onset of apoptosis (36,37⇓). NGAL has also been linked to apoptosis in reproductive tissues. Epithelial cells of the involuting mammary gland and uterus express high levels of NGAL, temporally coinciding with a period of maximal apoptosis (38). It is likely that NGAL regulates a subset of cell populations by inducing apoptosis. Stimulated epithelia may upregulate NGAL to induce apoptosis of infiltrating neutrophils, thereby allowing the resident cells to survive the ravages of the inflammatory response. Alternatively, epithelial cells may utilize this mechanism to regulate their own demise. However, it is interesting to note in our studies that induction of NGAL after early renal ischemia-reperfusion injury occurs predominantly in proximal tubule cells that did not display TUNEL-positive nuclei. Other recent studies have revealed that NGAL enhances the epithelial phenotype. NGAL is expressed by the penetrating ureteric bud and triggers nephrogenesis by stimulating the conversion of mesenchymal cells into kidney epithelia (21). Another lipocalin, glycodelin, has been shown to induce an epithelial phenotype when expressed in human breast carcinoma cells (40). These findings are especially pertinent to the mature kidney, in which one of the well-documented responses to ischemic injury is the remarkable appearance of dedifferentiated epithelial cells lining the proximal tubules (41). An important aspect of renal regeneration and repair after ischemic injury involves the reacquisition of the epithelial phenotype, a process that recapitulates several aspects of normal development (42). This suggests that NGAL may be expressed by the damaged tubule to induce re-epithelialization. Support for this notion derives from the recent identification of NGAL as an iron-transporting protein that is complementary to transferrin during nephrogenesis (21). It is well known that the delivery of iron into cells is crucial for cell growth and development, and this is presumably critical to postischemic renal regeneration just as it is during ontogeny. Because NGAL seems to bind and transport iron (21), it is also likely that NGAL may serve as a sink for iron that is shed from damaged proximal tubule epithelial cells. Because NGAL can be endocytosed by the proximal tubule (K. Mori and J. Barasch, unpublished observations), the protein could potentially recycle iron into viable cells. This might stimulate growth and development, as well as remove iron, a reactive molecule, from the site of tissue injury, thereby limiting iron-mediated cytotoxicity. Our results showing co-localization of NGAL in PCNA-positive regenerating and proliferating tubule cells lends further support to this hypothesis. A major implication of our findings pertains to the possibility of NGAL’s being a novel urinary biomarker for ischemic renal injury that compares favorably with other biomarkers that have been described. Perhaps the best-studied example is kidney injury molecule-1 (KIM-1), a putative adhesion molecule involved in renal regeneration (43,44⇓). In a rat model of ischemia-reperfusion injury, KIM-1 was found to be upregulated 24 to 48 h after the initial insult, rendering it a reliable but somewhat late marker of tubular cell damage. Recent elegant studies have shown that KIM-1 can be detected in the kidney biopsy and urine of patients with ischemic acute tubular necrosis (45). However, this detection was documented in patients with established ischemic renal damage, and the utility of urinary KIM-1 measurement for the detection of early subclinical injury thus far has not been validated. In another recent example, Cyr61 was found to be a secreted cysteine-rich protein that is detectable in the urine 3 to 6 h after ischemic renal injury (8). However, this detection required a bioaffinity purification step with heparin-Sepharose beads, and even after such purification, several cross-reacting peptides were apparent. In contrast, our study demonstrates that NGAL was easily and rapidly detected as relatively clean immunoreactive peptides in Western blots with as little as 1 μl of the very first unprocessed urine output after renal ischemia in both mice and rats. In addition, urinary NGAL was evident even after very mild “subclinical” renal ischemia, despite normal serum creatinine levels. Furthermore, urinary NGAL detection far preceded the appearance of traditional markers in the urine, including β2-microglobulin and NAG. Finally, it is worth noting that NGAL was also detectable in the urine early after cisplatin administration, at a time when other morphologic and biochemical indicators of renal injury were absent. Thus, the upregulation and urinary excretion of NGAL may represent a rapid response of renal tubule cells to a variety of insults, and the detection of NGAL in the urine may represent a widely applicable noninvasive clinical tool for the early diagnosis of tubule cell injury. In summary, our data indicate that NGAL represents a novel, sensitive, noninvasive urinary biomarker for renal ischemia. It will be important in future translational work to examine the expression of NGAL in the urine of patients with mild and early forms of ischemic renal injury. It is hoped that such early detection may enable clinicians to institute timely interventional efforts in ARF, a condition still associated with a dismal prognosis for which novel therapies are desperately needed. Furthermore, it is hoped that such rapid and simple detection of urinary NGAL in patients with subtle, subclinical ischemic renal injury (e.g., living related kidney transplants, vascular surgery, cardiovascular events) or subclinical nephrotoxic damage (e.g., the use of contrast agents and aminoglycosides) will alert the clinician to institute maneuvers aimed at preventing progression to overt ARF. This work was supported by grants from the National Institutes of Health/National Institute of Diabetes and Digestive and Kidney Diseases to P.D. (DK53289, DK52612) and J.B. (DK55388 and DK58872).